My other grandmother (aka Granny) sent Lily some great stuff. Have you ever seen onesies that cute?? I think not. There was a great little Christmas sleeper with matching hat that she will be wearing on Christmas Day and some wonderful little blankets. I’m told you can never have too many blankets. 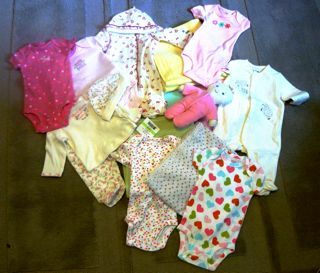 Lily says thank you to Granny for all the great clothes, blankets, and little doll. P.S. Today I opened up a package of newborn diapers and I’ve decided THOSE are the cutest things I’ve ever seen, baby socks are second. But those teeny tiny diapers …. I about lost my mind over them. Can’t wait to have a teeny tiny person to put in them.